Not enough time in the morning for breakfast? Well make time with the new Breville Radio Toaster. 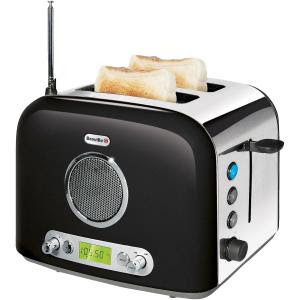 As with most clever ideas it's simplicity itself, a radio/alarm combined with a toaster, so you can wake up to the sound of your favourite morning radio station and instead of pressing the snooze button for another ten minutes in dreamland simply lower two slices of bread into the toaster and voila! Evan Davies and the wonderful aroma of toast in the bedroom. Of course you still do have to get out of bed to get ready for work, and hopefully earlier than the 10:58 that is shown on the photograph above. I'm not sure who this appeal to, I had a Teasmade back in the early 1980's to get each day started with a cup of coffee, the problem was once the alarm went off and the water started boiling I wanted to be up and out of bed. We used to have a coffee filter machine rigged up to a time switch and it was great. No need for an alarm either : the hissing and gurgling noises woke you up but there was also the smell of fresh coffee. One of the great smells isn't it, no wonder Estate Agents still suggest fresh coffee and warm bread as welcome smells for perspective housebuyers. ...add bacon & egg cooking to the coffee and bread smells and you have heaven!